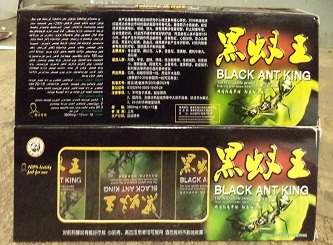 The Food and Drug Administration (FDA) is warning consumers to not buy or use Black Ant King, Black Mamba Premium, African Superman, and Bigger Longer More Time More Sperms (sic), which are all marketed for sexual enhancement. Black Ant King was found to contain undeclared sildenafil, the active ingredient in Pfizer’s Viagra. Viagra is a phosphodiesterase type 5 inhibitor indicated for the treatment of erectile dysfunction (ED). Sildenafil may interact with nitrates such as nitroglycerin and lower blood pressure. Nitrates are often taken by men with diabetes, high blood pressure, high cholesterol, or heart disease. These products were identified by the FDA during an international mail shipment search.